Today, significantly better tools are required to organize and integrate the huge volumes of sensor and equipment data for analysis; the conventional tools available for professionals within the IoT or the operational technology (OT) arena still fall far short of real world needs. Before delving into the new thinking that makes this story possible, let’s talk about why it’s necessary at all. IT professionals talk these days about the need for ever-evolving information services that can be made available anywhere, anytime, for any kind of information, yet the IT community rarely has the experience and background to architect and integrate real world physical systems. In the course of the last two decades, the world has become so dependent upon the existing ways computing is organized that most people, inside IT and out, cannot bring themselves to think about it with any critical detachment. With each additional layer of engineering and administration based on historical IT design principles, computing systems come closer and closer to resembling a fantastically jury-rigged Rube Goldberg contraption with development and maintenance costs that inhibit the growth of IoT applications. The reason is simple. Today’s computing systems were not really designed for a world driven by pervasive and diverse information flow and interaction. It has become evident that the larger software, data and BI players are not likely to become the defacto leaders in Smart Systems and IoT analytics. While the “traditional,” players may have what appears to be a head start they are just not accustomed to the unique characteristics and requirements of physical sensor and machine-based applications within the IoT arena. A growing number of relatively young companies are introducing products that have been purposely designed for IoT analytics. 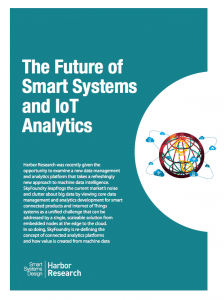 This paper is about an important new IoT data analytics platform and application offering from SkyFoundry. The SkyFoundry team of innovators understand that conventional IT and business intelligence tools we are working with today to discover, manage and analyze machine data were not designed to really address operational technology (OT as opposed to IT) applications and challenges. SkyFoundry’s SkySpark platform has been designed to provide an end-to-end software architecture that matches the often unruly IoT world and efficiently provides business insight for organizations by aggregating, mining and analyzing data generated from sensors, equipment, machines and products, wherever those devices and their data may be located. SkyFoundry’s approach is not about leveraging aging IT technology into a new application context; it’s about looking forward to a single, unified platform for device data interactions which liberates information and value creation by abandoning traditional relational database and client-server computing models. SkyFoundry’s approach provides a single unified platform for data aggregation, management, search, discovery, analysis and prediction across diverse machine data types. The result is a truly new approach to data analytics that provides a complete picture of the myriad of interactions and states that machines evolve through.